Retired Army Sgt. Dennis Dow, right, pets former military working dog Jag moments after Jag received the Lois Pope K-9 Medal of Courage in Washington, D.C., May 22, 2018. 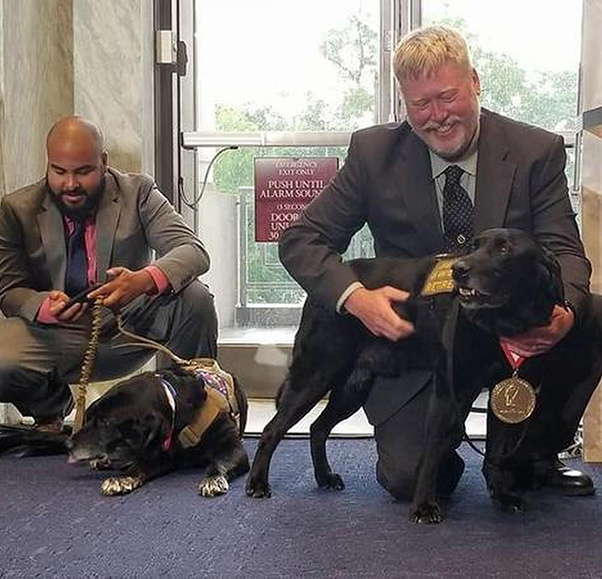 Four U.S. military working dogs were the latest recipients of the American Humane Lois Pope K-9 Medal of Courage May 22 at Capitol Hill in Washington, D.C. Among them was Jag, a 12-year-old black Labrador retriever, who now lives in Olympia, Wash., with medically retired Army Sgt. Dennis Dow and his family. The medal is given to a select group of military working dogs for their service. Jag had seven years of military service, starting out with Dow more than a decade ago. Dow’s wife, Jacqueline, said it’s nice to have a way to honor retired military working dogs, especially ones like Jag who continue to work long after they finish their military service. Both Dow and his wife have spent time as dog handlers. When Jacqueline, a former Army specialist, was a military working dog handler from 1989 to 1993, dogs were not able to retire from their service. Dow and Jag met several handlers at the ceremony who were happy to see dogs like Jag be recognized. Dow said he could see them remember the memories they had with their military working dogs. Dow and Jag have a long history together. 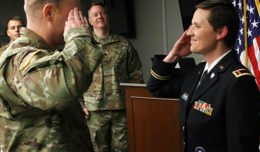 While stationed in Germany, they went on two tours in Afghanistan, the first from 2007 to 2008 and the second in 2010. During their first mission together, Jag was able to find a hidden weapons cache in Afghanistan. The two went on thousands of missions where Jag looked for improvised explosive devices and other enemy weapons. 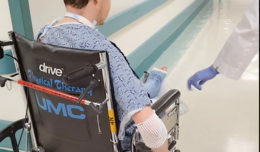 After their second tour in Afghanistan, Dow was considered medically unable to continue service, but Jag still had some time left. Retired Sgt. 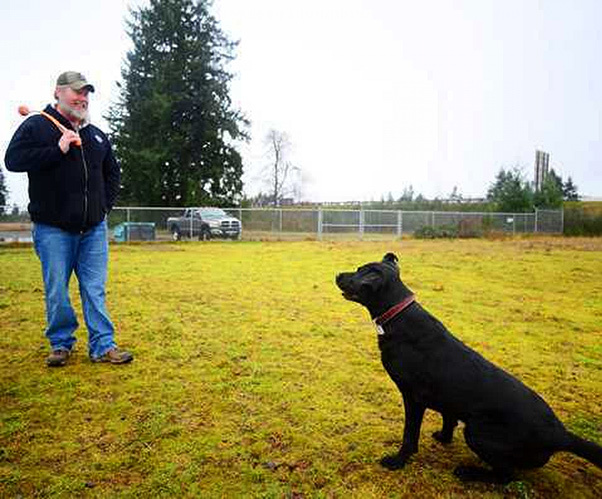 Dennis Dow plays with former military working dog Jag, his now-12-year-old black Labrador retriever, at the JBLM Dog Park Jan. 10, 2014, shortly after adopting him. In 2011, they went their separate ways. Dow and his family went to Joint Base Lewis-McChord for the medical evaluation board process. Jag remained in Germany and had two separate handlers. They didn’t quite have the same rapport with Jag as Dow did. The chance for Dow and Jag to be reunited came in the fall of 2013 when Jag was set to retire from his military working dog career. Because handlers have the first chance to adopt, Dow and his family welcomed Jag into their home in Olympia. It was a no-brainer for Dow and his wife, who didn’t get to bring her dog home. “There’s survivor’s guilt, but it’s something else to leave what seems like you’re child behind,” Dow said. Dow and Jag were still active for a few years after their retirements, helping out with the Lacey Fire Department. The two provided comfort and therapy for firefighters and civilians affected by fires and other tragedies. Now age 12, Jag has had to slow down in the last year after having two knee joints in his hind legs replaced. Despite his age, Jag is certainly not the type of dog to rest all day, Dow said; he seeks activity and interaction like when he and Dow were teamed with units. “Letting him interact with the firefighters has also helped him,” Dow said.